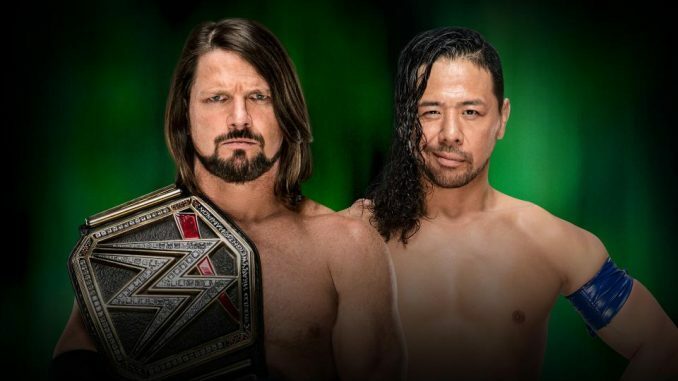 John Pollock previews tonight's WWE Money in the Bank event from the Allstate Arena with AJ Styles vs. Shinsuke Nakamura in 'Last Man Standing Match', two Money in the Bank Ladder matches, and Nia Jax defends the Raw women's title against Ronda Rousey. Tonight, is the WWE’s Money in the Bank event, their second show in as many nights at the Allstate Arena in Chicago (yeah, it’s technically Rosemont). This is one of the WWE’s most popular events of the year as the Money in the Bank concept has always produced by-and-large strong matches and allow the audience to play out many scenarios heading into the show. It’s also a concept that has served as a springboard for many mid-card players into the top mix. A performer winning the briefcase tips the hand of the company over who they see as a capable of that leap to the top mix. In 2017, we saw the addition of a women’s Money in the Bank match and Carmella winning the inaugural women’s version of the match. The typical booking of the match sees the WWE place the briefcase with an individual they see as a champion down the road and can receive mileage out of the frequent teases of cash-in. One of the best examples is Seth Rollins, who won the match in 2014 and cashed in at WrestleMania the following year and held the title throughout most of 2015 before an injury took him out. There have been many other examples that didn’t produce such an outcome with Dolph Ziggler as a reluctant winner in 2012, cashing in the following year on the night after WrestleMania and becoming champion. It ended up as the peak of his WWE career to this point, with an overall lack of faith in the vision of Ziggler as a long-term champion. Sheamus was another example winning in 2015, someone that didn’t feel like a fresh face for the main event mix and was met with indifference as the briefcase winner – and later as champion. Last year’s winner in the men’s match was Baron Corbin, which ended up as a total waste of a valuable tool for enhancing a performer’s stock. Corbin cashed in his shot, was attacked by John Cena, and lost to then-champion Jinder Mahal on television in an afterthought. Below is a preview of tonight’s card, Wai Ting & I will have a show posted late tonight reviewing the card. The feud has runs its course, failing to live up to the heightened expectations until this point. The spark for their WWE feud began at last year’s Money in the Bank show when they worked in an improvised sequence together that the audience responded to strongly with the two performers taking a chance and auditioning for something bigger, based on their past feud from New Japan Pro Wrestling that led to their Wrestle Kingdom 10 match. They have had three major matches from WrestleMania, the Greatest Royal Rumble, and Backlash. This match seems designed to be the culmination of the program and their best chance to leave a strong impression given the leeway they will have with this style of match. The buildup to this one has been simple but effective with Nakamura choosing the match and rendering victims unconscious as he counts to ten. The heel work by Nakamura has salvaged what has been a lackluster main roster run since April 2017. He feels re-energized and the character is one he can sink his teeth into and project very well. Styles has had the title for a long time that it feels like a good time to switch things up. You do have a strong babyface in Daniel Bryan that could be a big summer program for Nakamura unless they keep Bryan paired with The Miz this summer. On the heel side, Styles does have more options if he stays champion with Samoa Joe, Big Cass, Andrade Cien Almas, Rusev, and even Randy Orton when he returns if they wanted to bring him back as a heel. The two picks that jump out are Kevin Owens and Rusev. If Big E is added to the match as the New Day representative, I think there is a compelling reason to put the briefcase onto him as well. Rusev has pinned Daniel Bryan and Samoa Joe coming into this match and it would seem like a waste to have given him wins over those two without a solid plan in place to build upon them. Strowman and Joe are already at a certain level that I don’t think the briefcase is necessary for either and doesn’t place them at any higher level than they already are. Owens would be great with the constant teases and be holding the briefcase over the head of whoever is champion. The problem with a Raw talent winning is that Brock Lesnar isn’t on television most weeks and takes a lot of the intrigue away until he drops the title. As a match, this will probably be an excellent one given the talent involved and the time they will be allotted. If Strowman isn’t winning, he’ll probably receive a big spot to be taken out of the match and protected in doing so. I expect this match to be carefully laid out and will probably be a very good match. There are lots of options where you can go with Natalya as an obvious choice, especially if Ronda Rousey is winning the Raw women’s title. It may be too obvious, and you could argue the briefcase isn’t necessary for that feud. Ember Moon and Becky Lynch could both benefit a lot from the win. Moon is still new on Raw and this gives her an attachment to the title picture and an identity on the show, which she has lacked since her debut. Lynch has been lost in the shuffle over the past year and wouldn’t surprise me at all if she won. Sasha Banks, Charlotte, and Alexa Bliss really don’t need it as their characters are well-defined, they are over in their roles and I wouldn’t put it on either of those three. Lana should be used sparingly in the match and I don’t like the idea of her winning at all. From a booking perspective, this might be the most interesting match on the show as the outcome with debated regardless. It doesn’t feel like the right time for Rousey to lose when she is still so popular and it’s only her second televised match. You can do a finish that allows Jax to win while protecting Rousey with involvement from Stephanie McMahon, which leads to a bigger match for Rousey at SummerSlam as the title is still a long-term goal for her coming out of it. This wasn’t the original plan and the program was kickstarted cold at the NBC Universal upfronts. From what I’ve been told, the goal of the program wasn’t to turn Nia Jax heel and you could see them easing back over the past two-weeks. The fact Rousey tapped her out on Raw would suggest she is not winning the match tonight or done to throw everyone off tonight. It’s an interesting match to lay out. My gut says Jax will leave with the title, but if this goes on last, that would suggest that Rousey wins the title and they try to recreate her championship from the UFC. If ever there was a match to keep very short, this is it. The audience is going to eat this alive and I think a 2-minute match with Reigns winning decisively would be the best outcome. He gains revenge on Mahal, as this is a match he should win. Unless this feud is continuing and then you could see a non-finish to extend it further and the crowd will hate it. Their match wasn’t all that special at Backlash and had a definitive finish with Cass tapping out. The feud feels past its expiration and there is no doubt Bryan has been brought down a few pegs from this program and being out on television wrestling most weeks since WrestleMania. There are many other performers people want to see Bryan paired with and Cass isn’t one of them. I think this match needs to end the same way as the last, perhaps with the heel hook instead of the Yes Lock to further establish that submission. This feud needs to be done after tonight. I haven’t liked this match from the moment they announced it. Asuka has been tragically marginalized since the streak ended at WrestleMania. I don’t see them putting the title back onto Asuka, and with PWinsider.com reporting the idea that James Ellsworth could be back, it gives them an easy way of having Carmella retain the title and pin Asuka. This feud isn’t going to do much for Asuka, who seems directionless since the streak ended. On the night of WrestleMania, I had the attitude of seeing the bigger picture with Charlotte winning, now that we are more than two months removed you can’t argue that either Asuka or Charlotte is better off since WrestleMania. I think this going to deliver strongly. The audience will love Rollins and should hate Elias, so the atmosphere is key. If they go on early, perhaps even opening the main show, I think that would be the best position and the best opportunity for Elias to have his best match to date. Rollins has something special and its resulted in his best run since The Shield breakup. A title change is not out of the realm of possibility as long-term Rollins should be in the main event picture once the Universal title is back in the rotation as a regular title on the show until then he should stay as Intercontinental champion and probably retains. If Reigns and Mahal aren’t going 2 minutes, then perhaps this match will. I see Lashley destroying Zayn and winning emphatically. A lot of people enjoy Zayn as a heel, he’s very talented, but he’s designed as a setup guy for the bigger stars, such as Lashley. This has not been a good feud and is yet another that I’m hopeful ends after tonight. This could be the sleeper match of the show. The negative is that it’s on the kickoff show when the audience isn’t always hottest. However, the kickoff show also allows them in the neighborhood of 15 minutes and that’s a lot of time for two talented teams. The Bludgeon Brothers should retain, but if they work this match 50/50 it could be very strong.